Onnit Labs Review: Onnit Labs is quite possibly one of the most innovative personal development companies in the world. They’ve produced some of the most effective nootropics and health supplements to help people enhance their mental and physical abilities. But before buying supplements and nootropics, you want to know (1) that you’re buying from a reputable company, and (2) that the products are actually going to help you in some way. Here’s a complete Onnit Labs review, so you can decide whether or not Onnit products are for you. Before giving a complete Onnit Labs review, it’s important to understand Onnit’s history, and the man behind it all. Aubrey Marcus was so invested in his own personal development that he started Onnit so he could work towards ‘Total Human Optimization’. He wanted to be the best he could be, and help others to do the same. Since 2010, the company has grown dramatically and Onnit now has over 250 different products. Each product is designed to enhance both mind and body, and there are several Onnit products that are completely unique – you won’t find them anywhere else. Unlike other supplement companies, Onnit Labs doesn’t just focus on one type of product. Onnit’s philosophy is about optimizing mental and physical performance, so there are different products for different aspects of health and personal development. They create and sell nootropics, health supplements, nutrition bars, drinks, oils and fitness equipment. Who are Onnit Products For? Onnit products can literally be used by anyone. Seriously, there’s an Onnit product for everyone. There are nootropics that enhance mental activity, making it easier to concentrate, learn and analyze. Then there are also Onnit products that enhance physical performance, from oils that aid joint mobility to protein bars. Onnit is brand favored by those looking to make the most of life, be the best they can be, and achieve success. People from all walks of life have found Onnit products beneficial, including public speakers, athletes, students, writers and even medical professionals. Now that you’ve got a bit of background information, it’s time to delve a little deeper into this personal development company. So without further ado, here’s our complete Onnit Labs review, so you can get a better idea of the company as a whole. If you’re looking into investing in some of Onnit’s nootropics and supplements, you want to see some evidence that they work, right? Nootropics and supplements are on the rise, which means there are more options being created every day. But Onnit isn’t interested in creating generic nootropics that may or may not work. They’ve spent time and money making sure they develop the best formulas. Onnit works with medical professionals and athletes to research and test the ingredients and effectiveness of their products. Doctors review the ingredients in each product, and make improvements where necessary, so that each product contains the best possible combination of ingredients. Then new products are tried and tested by professional athletes. One reason so many people love Onnit is because it doesn’t feel like just another company, it’s a community too. The Onnit team is all as interested in personal development and human enhancement as you are. When you buy your first Onnit product, you haven’t just made a purchase: you’ll feel like you’ve joined the Onnit club. Onnit customers are constantly impressed by the company’s transparency. Aubrey Marcus is open about his own journey, philosophy and goals for human optimization, which is perhaps why so customers connect so deeply with the brand. Customers were also pleasantly surprised when the company owned up to a recent mistake that could easily have been swept under the carpet. After a data breach occurred, they let customers know despite the fact that no damage had been done. They apologized sincerely and came up with a solution to the problem. Onnit’s money back guarantee on their products is also another indicator of how much they believe in their products. They genuinely want their products to help enhance lives, and they want their customers to feel fully satisfied. Alpha Brain: The Best Nootropic on the Market? 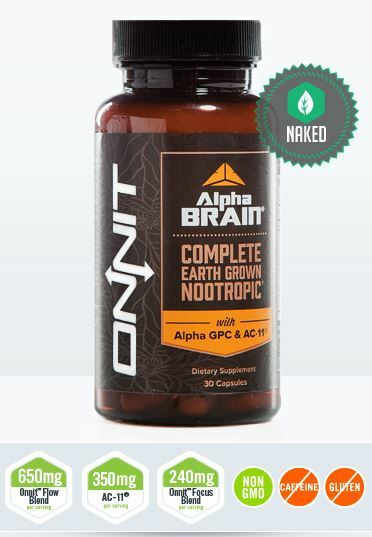 Alpha Brain was one of the first Onnit products launched and over the years it’s been modified and improved to become one of the best nootropics on the market. It’s a product that sums up what Onnit is all about. It enhances mental speed, which can make tasks easier to understand and complete, and can also improve physical performance by improving our response speeds. It does so by combining ingredients like Vitamin B6, vinpocetine, bacopa monnieri, huperzia serrata and more. These ingredients then fuel your neurotransmitters, making brain signals stronger, faster and more responsive. One of the main reasons Onnit has gained so much traction over recent years is simply because they give customers exactly what they want. You’ll notice that Onnit doesn’t have overly pushy marketing techniques, and that’s because once people are talking about their products, they sell themselves. One way Onnit stays ahead of the game is by asking customers exactly what they want to see next or if there’s anything they’d change. And once they’ve got customer opinions, they act on them. So when consumers notice a gap in the market, so does Onnit, and Onnit Labs creates a product to fill the gap. With such constant innovation, you can always rely on Onnit to create great products that customers want to buy. Hopefully this Onnit Labs review has given you a clearer idea about the company as a whole, their vision, and how Onnit products can benefit you. Onnit Labs is currently one of the best places to go for all things personal development related. You can get nootropics and health supplements for the mind, and nutrition bars and even fitness equipment for the body. Onnit’s philosophy is all about enhancing every part of yourself, so that you can be the best version of yourself at all times. Their products are designed to help you pave the way to success. So there’s just one thing left to do…decide which of their products suits you best!